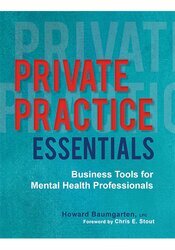 Private Practice Essentials is an innovative, practical guide and workbook for creating business and clinical success in your counseling and therapy practice. You’ll be guided through numerous exercises that provide a solid and personalized plan with realistic and attainable goals. It’s like having a professional business consultant right at your fingertips. Howard Baumgarten, LPC, has over 25 years of clinical experience and is an expert on how to successfully merge high standards in mental health care with solid business principles. He has served the Denver area with a successful private practice for over 15 years, consults with business owners in the field of mental health practice, and provides training programs across the country.